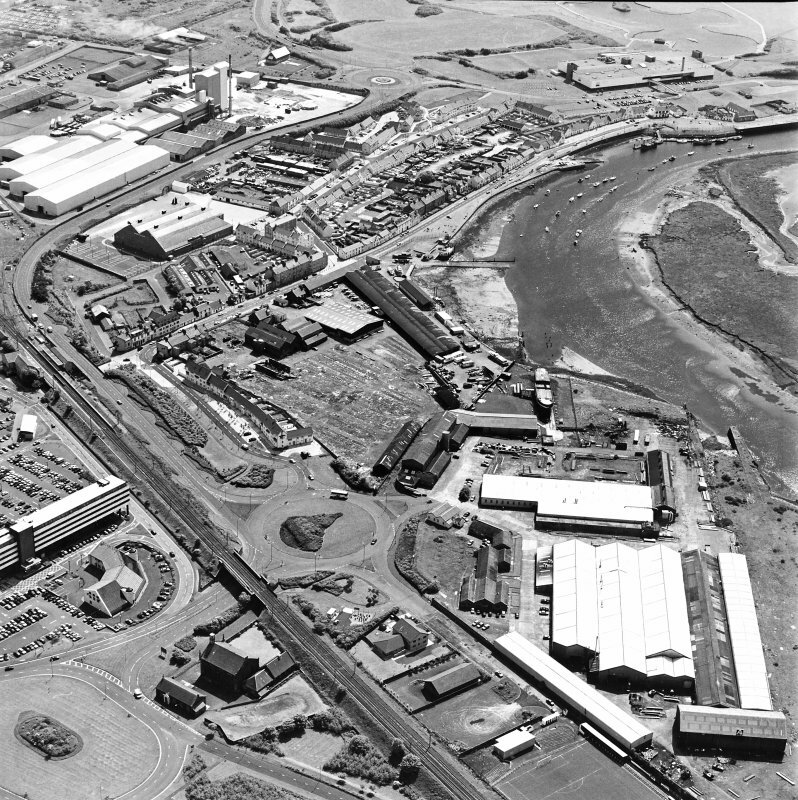 Aerial view of Irvine Harbour, the Scottish Maritime Museum (including SV Carrick), the sawmill and Ayrshire Metal Products, taken from the W.
For (underwater) obstructions in and around the harbour, see NS33NW 8001 and NS33NW 8002. (Location cited as NS 303 380). 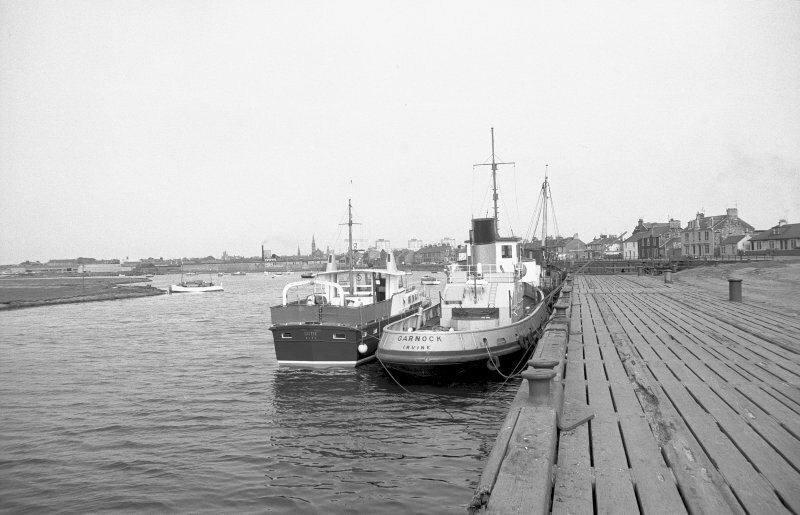 Irvine Harbour, late 19th century. 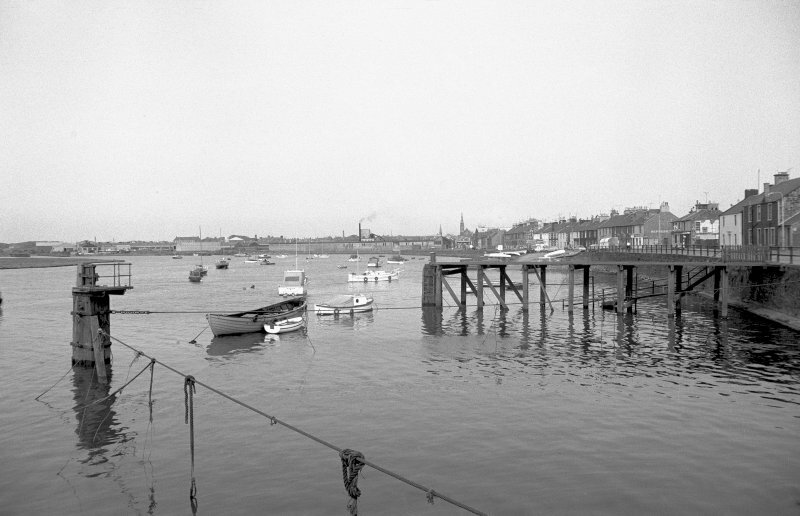 A rivermouth harbour, with the main quays (wood-piled) on the south bank. 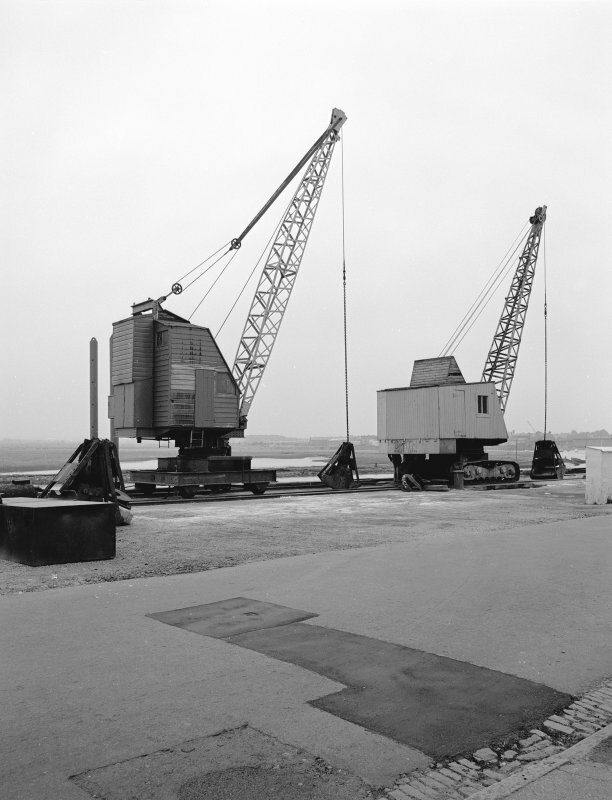 There are three rail-mounted cranes, two by Alexander Chaplin & Co, Glasgow, and one by Smith Rodley. The harbour office and custom house [NS33NW 40.04 and NS33NW 40.05 respectively] are small single-storey structures. (Location cited as NS 3037, NS 30 38 and NS 31 38). 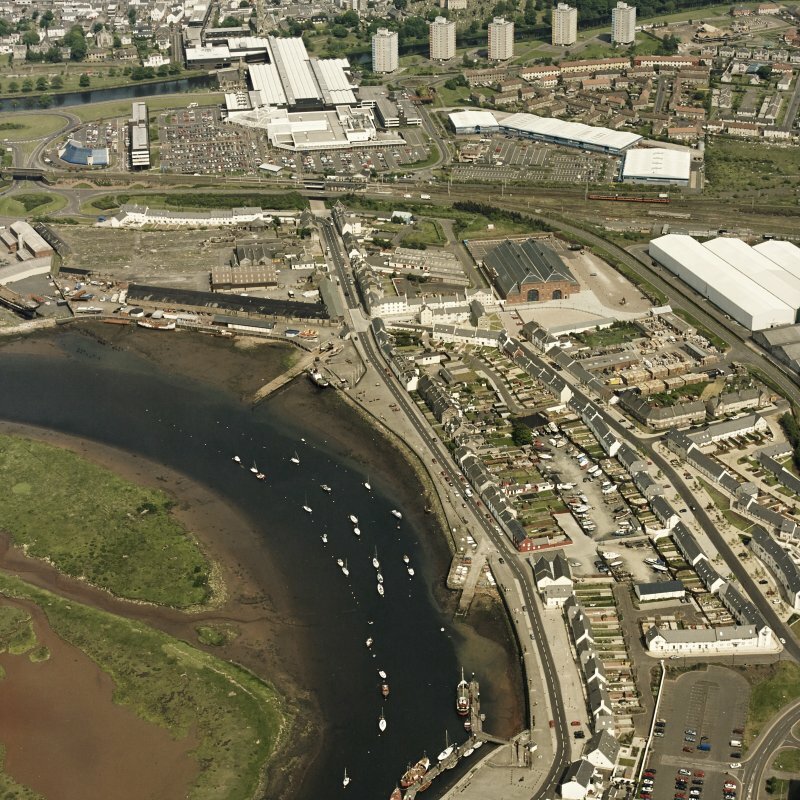 The development of Irvine harbour has been largely governed by the relationship of the burgh [NS33NW 43] to the neighbouring waterways - the River Irvine in its lowermost reaches and the River Garnock, a major right-bank tributary. This latter stream enters the Irvine estuary a short distance above the sandy foreshore over which their conjoined waters discharge into the Firth [at NS 302 379]. It has been stated that the Garnock once had a mouth of its own, entering the sea some two miles further to the N. This view is based on Blaeu's map of Cunninghame (1654), which is totally at variance with the present topography of the region. It is true that the area W of the lowermost reach of the Garnock is low-lying and sandy, and both Statistical Accounts quote evidence to show that it was once covered by the sea. These observations could well be explained by a general recession of the sea, such as evidently took place at Stranraer [NX06SE 44: centred NX 05955 60850]. By contrast, Blaeu's map of Kyle, in the same collection, shows the Garnock joining the Irvine much as it does today. It is this behaviour of the River Irvine, however, that mainly calls for discussion. Where it passes the old town, which stands on the right [NE] bank, it is running from SE to NW, but beyond the town it curves W, then S, forming a considerable oxbow, the neck of dry ground between the lateral reaches of which it is only some 500yds [457m] wide at narrowest. The position of the medieval harbour has been fixed by the presence of a street called the Seagate [name: NS 3194 3913], together with the remains of Seagate Castle [NS33NW 3]. The Seagate no longer reaches the waterfront, as the tide has been controlled by a weir some distance downstream. From this ancient site, the new harbour is completely separate, as it lies on the left [S] bank of the river below the oxbow, its frontage beginning where the course of the channel curves from S to W and the lowermost reach runs on to the bar at the river mouth. 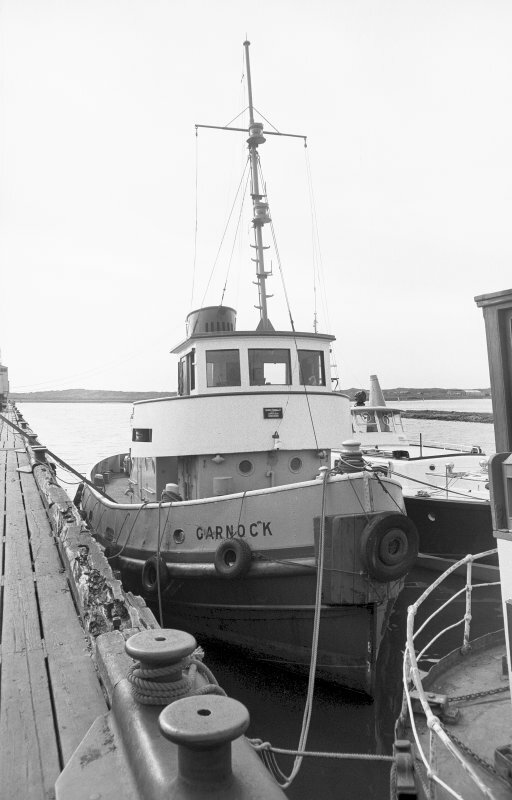 On the way, it receives the inflow, from the N, of the Garnock. From the upstream end of Harbour Street [NS33NW 136] is some 900yds [823m] direct to the Seagate site, but the distance measured round the oxbow would have been at least 2700yds [2470m]. That the Romans had a port at Irvine was suggested many years ago by Prof J K St Joseph. Of the written records, all post-mediaeval, A F McJannet has produced a convenient summary. His earliest reference, which deals with the familiar choking-up of the port, goes back to 1563-6, just antedating Leslie's History, and from 1579 onwards there follows a succession of appeals to the Convention of Royal Burghs or the Privy Council for help in the repair of harbour-works. The Convention alludes, in 1605, to the 'say porte and herberie with the haill bulwarkis thairof', and the term 'bulwarks' suggests more substantial works than mere timber jetties. 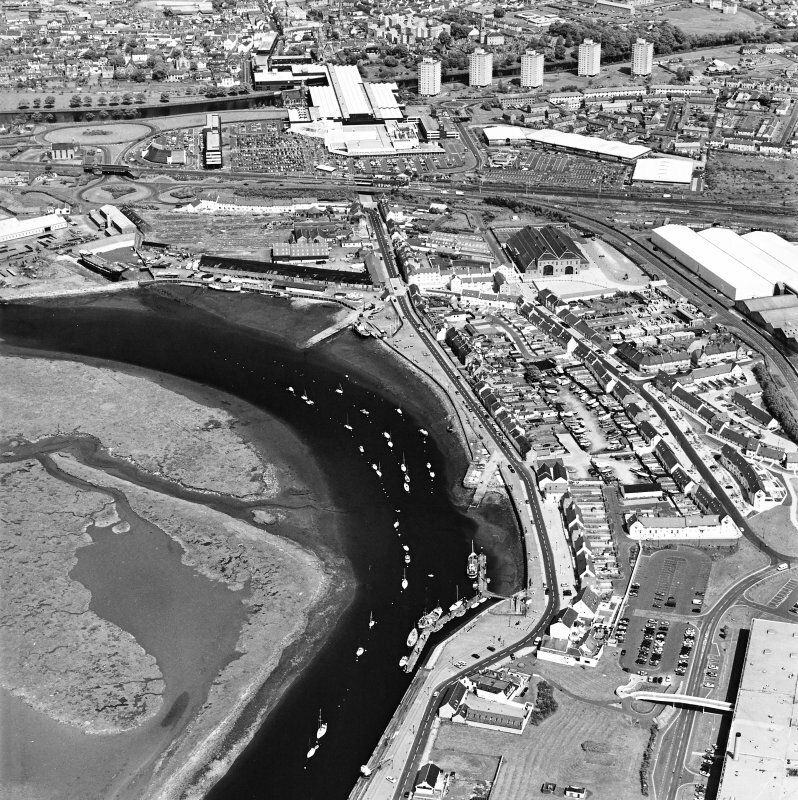 An Act of 1587, which appointed a commission of enquiry, having brought no useful result, the burgh accordingly looked elsewhere for an alternative harbour-site. The first place chosen was on the island of Little Cumbrae [name: NS 145 515]], but arrangements for its purchase broke down, and instead a site was developed shortly before 1608 on the Troon peninsula [Troon: NS 310 310]]. Ships of over 220 tons, too large to enter the harbours of Saltcoats [NS24SW 44], Irvine or Ayr [NS32SW 123.00] could find anchorage in 10 to 14 fathoms [18 to 26m] in an area E of, and covered by Lady Isle [name: NS 275 293] an islet lying some 2 miles [3.2km] SW of Troon, and consequently an organised and well-sheltered harbour behind the Troon peninsula itself was an attractive proposition. One may recall that the town of Glasgow was later (c. 1776) to set up a pair of beacons on Lady Isle to indicate the position of the anchorage, no doubt for the benefit of ships serving its merchants. Operations at Troon seem to have been abandoned, however, and in 1613 another impost was needed for the repair of Irvine harbour. 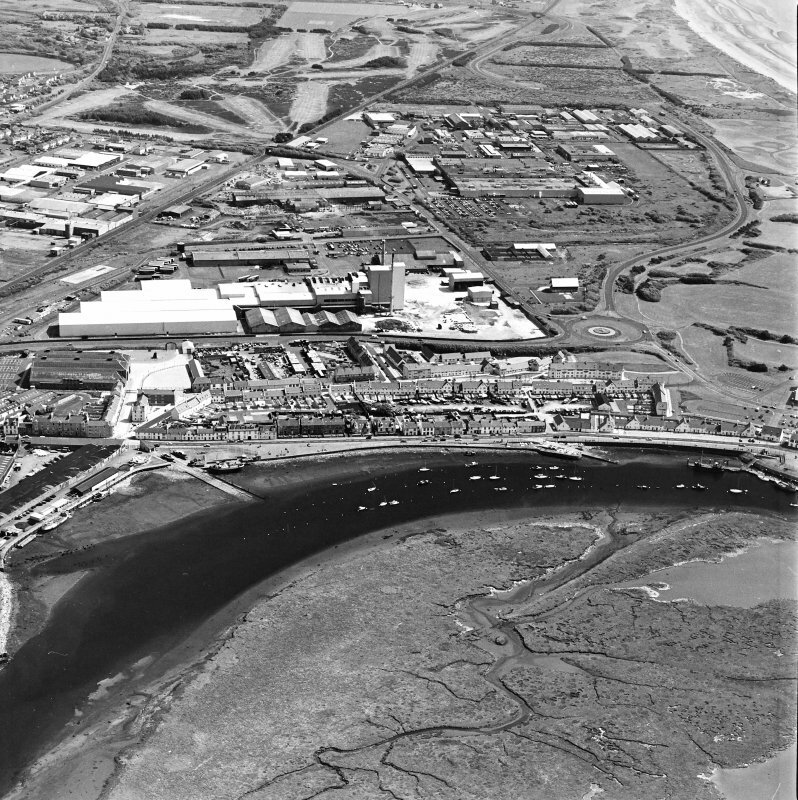 A fresh start was made at Irvine in 1665, with a decision to build a new harbour and to cut an artificial channel. Such a cut had also been envisaged in 1572 with the intention of making a canal through the neck S of the oxbow, in order to give direct access to the Seagate site. 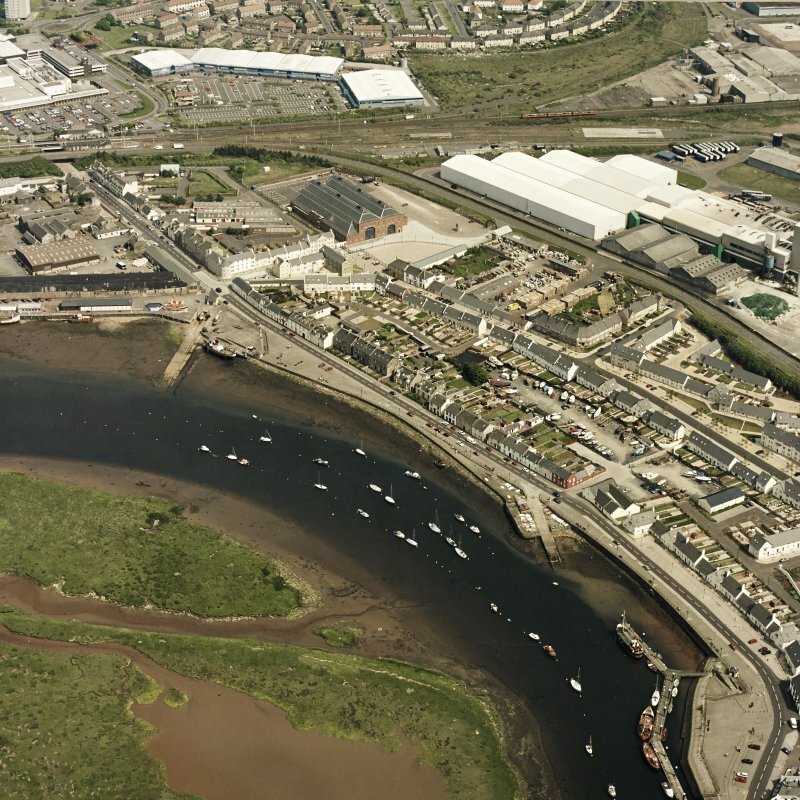 In fact, the new harbour flanked the estuary on its left [S] bank, and was given a masonry quay; the burgesses were forced to work on its construction in person, and some of the stones that were used in it were pulled out of the river's bed. An anonymous visitor of 1723 is quoted by McJannet as describing Irvine as a 'tolerable seaport' and as noting 'upon the Key, a good face of business, especially the coal trade to Dublin'. 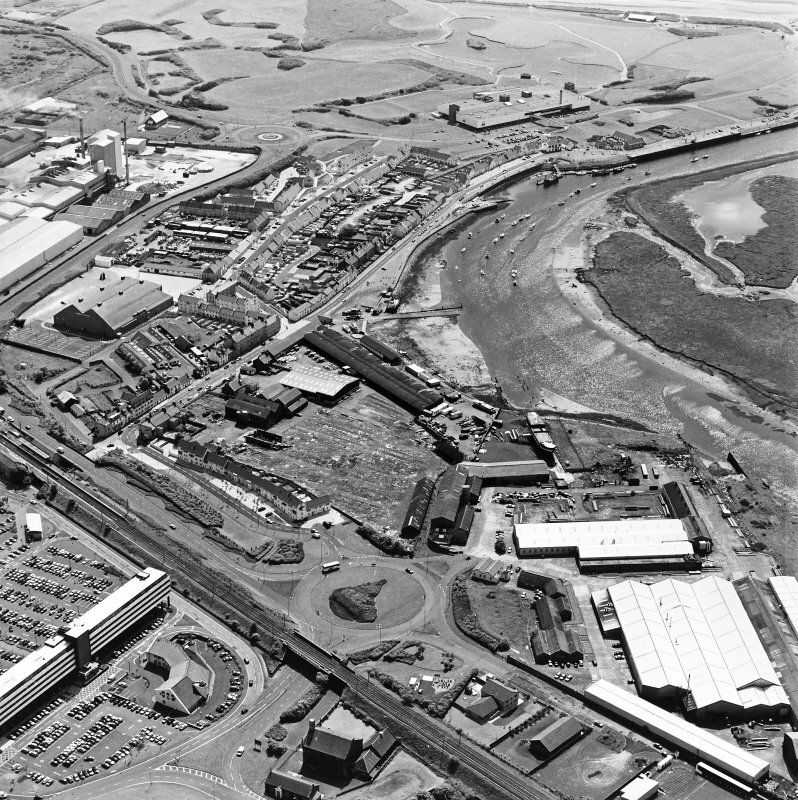 In 1793 the harbour was well established, with storehouses, coal-sheds etc. It was approached from the town by a road along the S bank of the river, beside which fishermen's houses had been built in the course of the preceding forty or fifty years. Some details about the harbour as it stood in the earlier 19th century are given by the Parliamentary Report of 1847. This shows that, in 1840, the lowermost 600yds [549m] of the river-channel were narrowed by a series of half-tide stone 'jetties' run out from either bank at an angle of 45 degrees; they deepened the channel by some two or three feet [0.6 or 0.9m], by increasing the scour of the current, and also broke up the run of waves which had crossed the bar, so minimising their potentially dangerous effects higher up the estuary. The entrance was 240ft [73.2m] wide, and the outfall was directed by a 'rude stone pier or dyke' on the S bank, 500yds [457m] in length. The bar, which was liable to shift, gave a depth of 13ft [4m] at high springs. 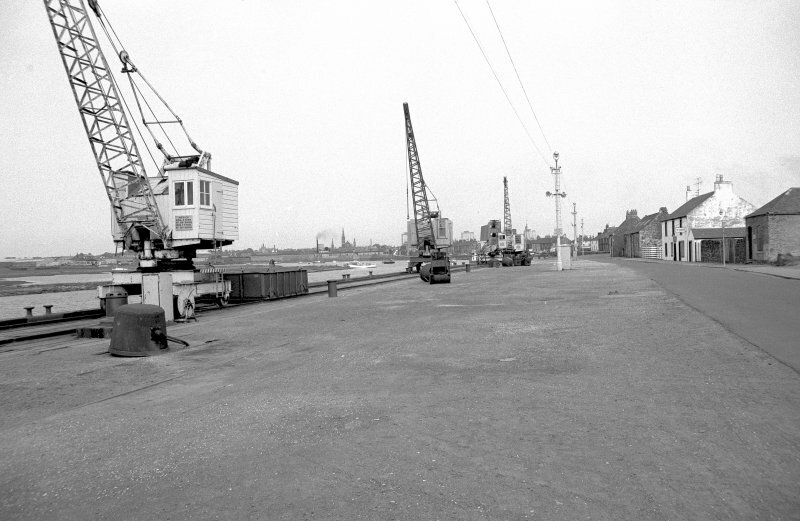 There was a stone quay about 200yds [183m] long, a timber wharf (added in 1846), and shipbuilding yards and slips. Few traces of these arrangements can be seen today. 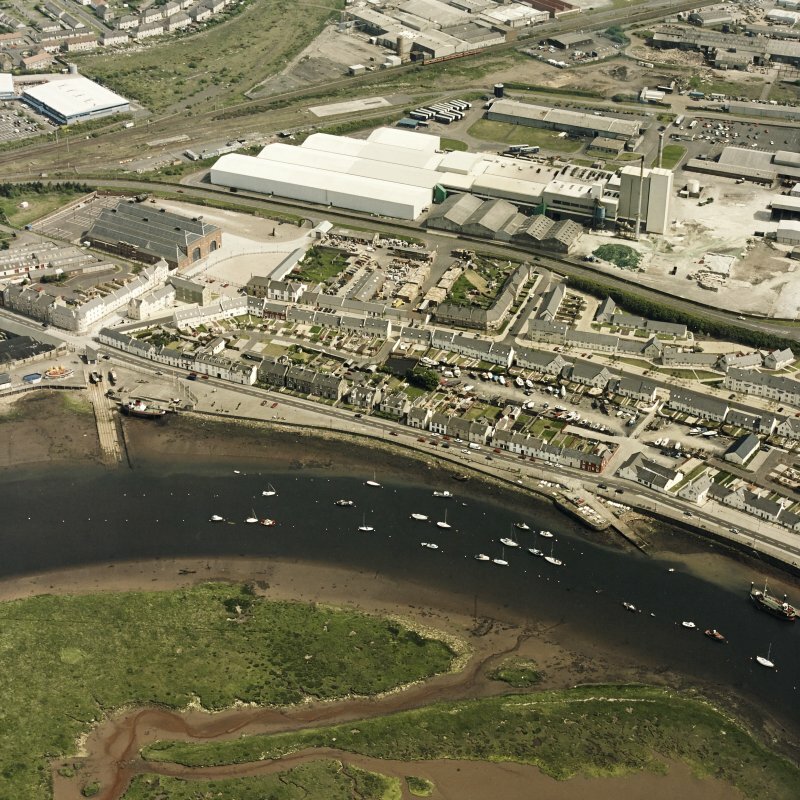 It is true that Harbour Street, with houses on its landward side and an open frontage to the water, recalls a feature common in maritime burghs and often named 'The Shore', but nothing in the outer appearance of the surviving houses suggests a flourishing waterfront. Wharfage with bollards extends downstream all along the bank of the river, but such remains of industrial equipment as survive seem to be of no great age and are also clearly in decay, while activity seems to be centred in an anchorage for yachts. Opposite the Garnock's inflow [location: NS 306 382], there is another stretch of wharfage, of similar appearance, which ends, as does the road from the town, at the Pilot House [NS33NW 40.02]. Further out again, the remains of the breakwater [NS33NW 40.01] continue in the form of a walkway; its outermost end was hidden by a rising tide when the site was visited, but the OS map carries it out for some 500ft [152m] towards the bar. The ruins of the 'jetties' of 1840 can be recognised in a series of rickles of stone which stretch out across the tidal flats on either bank, four of those on the S starting from the side of the breakwater and the fifth extending from its end to the S end of the bar. At the heads of some of these rickles, there stand high posts improbably marked as mooring-posts on the OS map. Along the N bank of the estuary, W of the mouth of the Garnock, there stretches an embankment some 350yds [320.1m] long; the adjacent wide sands and saltings show remains of numerous mooring-posts, some of them as much as a quarter of a mile [402m] above the Garnock's mouth. 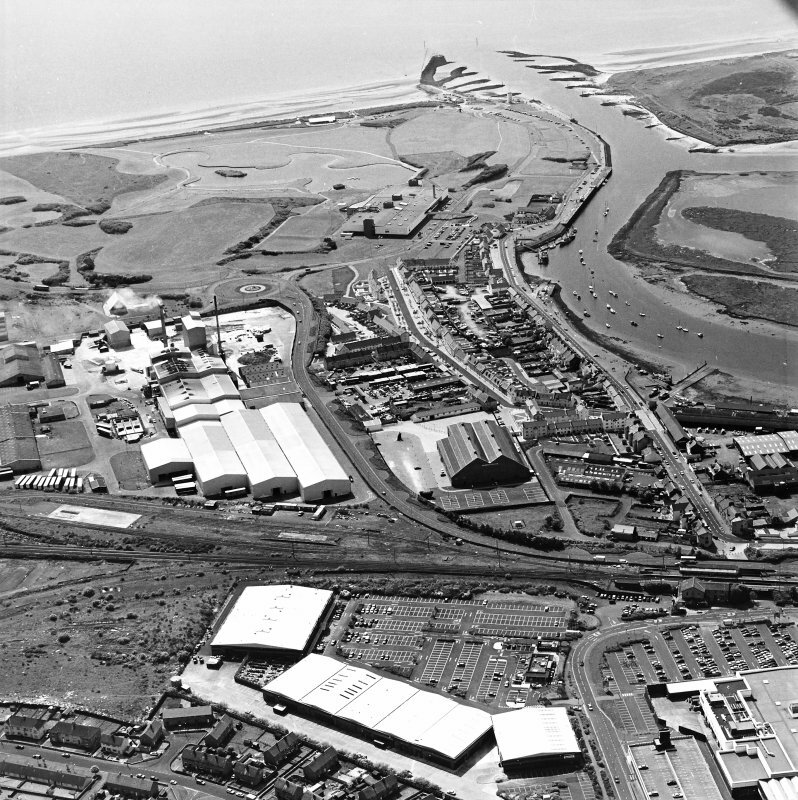 The pier [NS23NE 1.05] just above the mouth is a modern provision, belonging to the industrial establishments [NS23NE 1.00] at Ardeer. 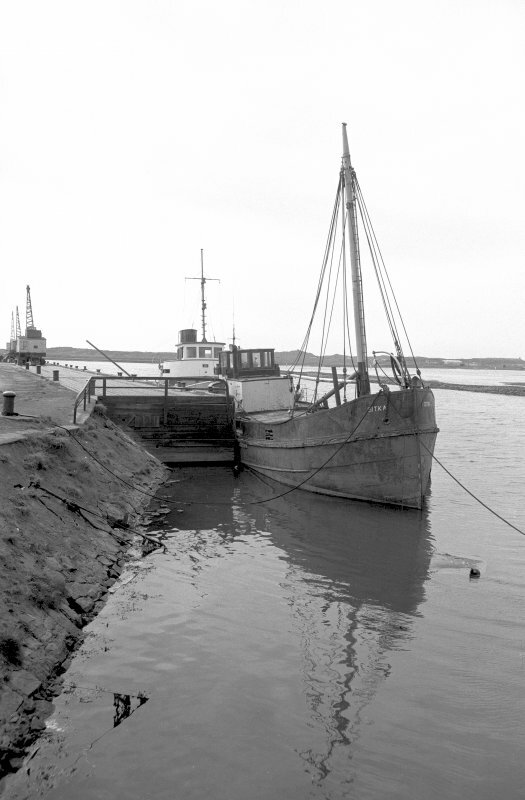 The silting-up of the harbour remained a problem. The Parliamentary Report of 1847 noted that the lower reaches of both the Irvine and the Garnock traversed flat, low-lying ground, with the result that good reserves of backwater built up at every tide, and it recommended that this tendency should be encouraged - for example by causing the rivers to converge at an acute downstream angle, instead of at right angles, as in fact they still do. Much the same point had been made in 1839 by Gibb, who held that the main object should be to obtain deeper water at the entrance; he considered that it was 'only from the effect of the reflux of the waters of Irvine and Garnock that the entrance to the harbour is maintained'. He suggested the construction of a system of openwork wooden 'beacons', to narrow the channel and provide moorings for ships, but there is nothing to show that this plan was ever adopted. 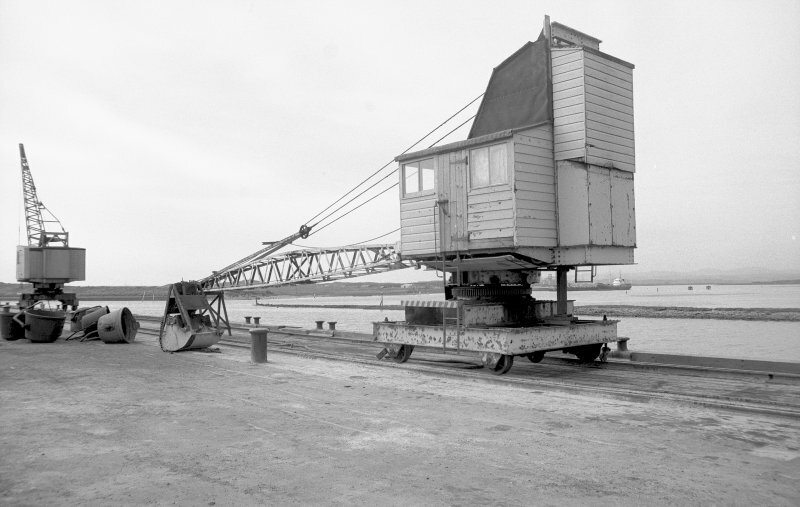 As early as 1826, the use of a steam dredger had been recommended, to remove the bar and keep the channel clear. 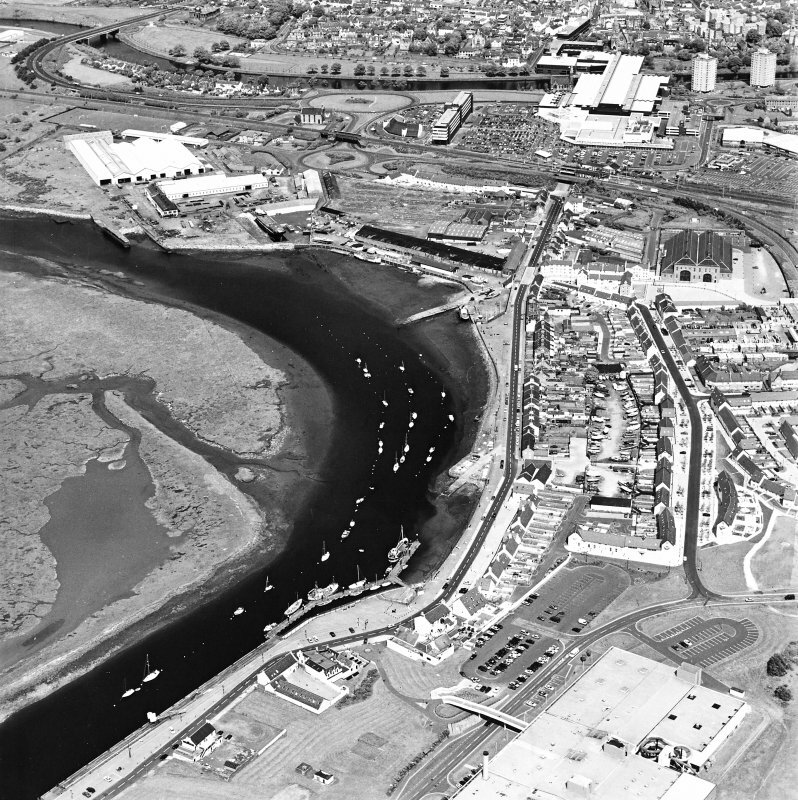 The commercial fortunes of Irvine were continually influenced by the harbour's physical vicissitudes, though the local fisheries no doubt served to maintain a permanent seafaring background. Tucker, for example, observed that the town was damaged by the silting-up of the river 'soe as it wrestles with life to maintain a small trade to France, Norway and Ireland' with herrings and various commodities. 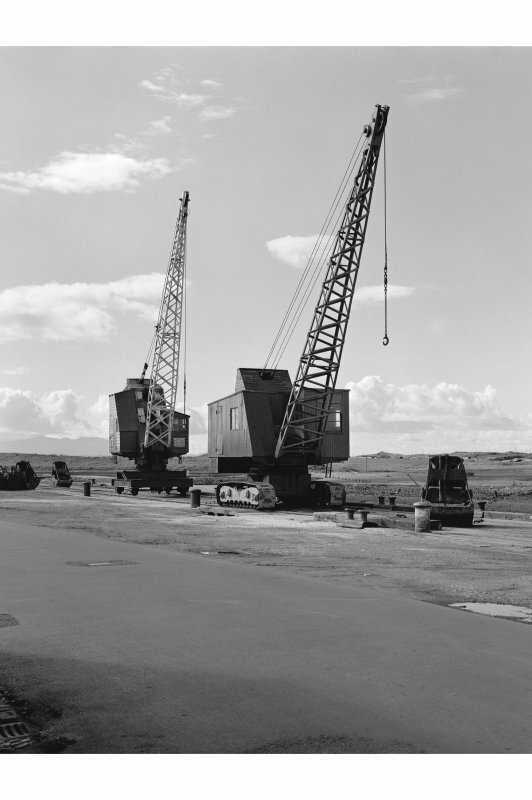 Only three or four ships were owned in the town at this time, none of them exceeding sixteen tons. 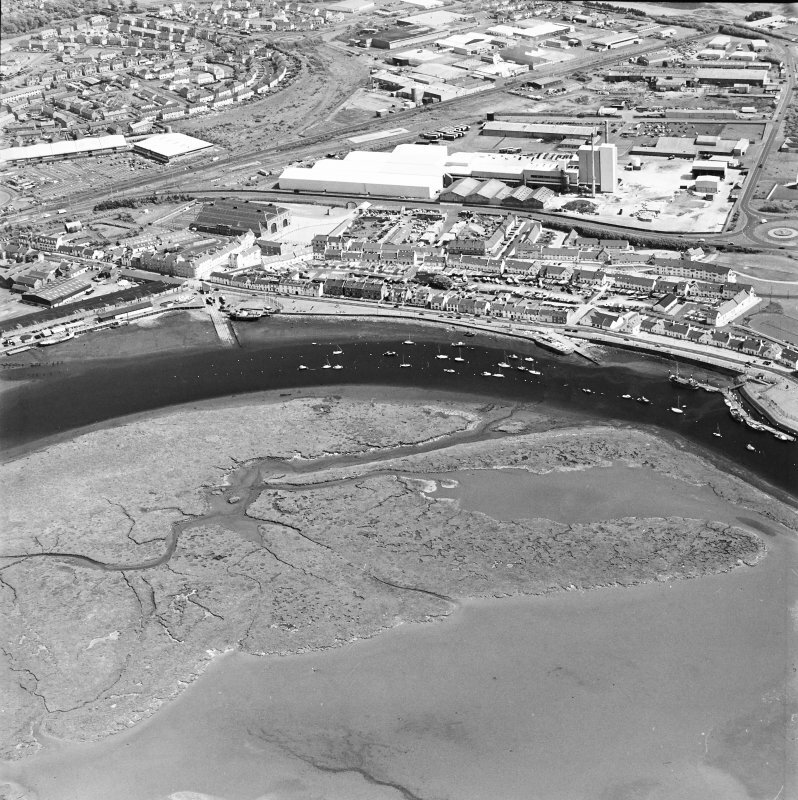 There is also a record that the town's trade improved after the harbour was formed at the river mouth. From Tucker's report, too, there emerges the interesting point that, in his time, ie. 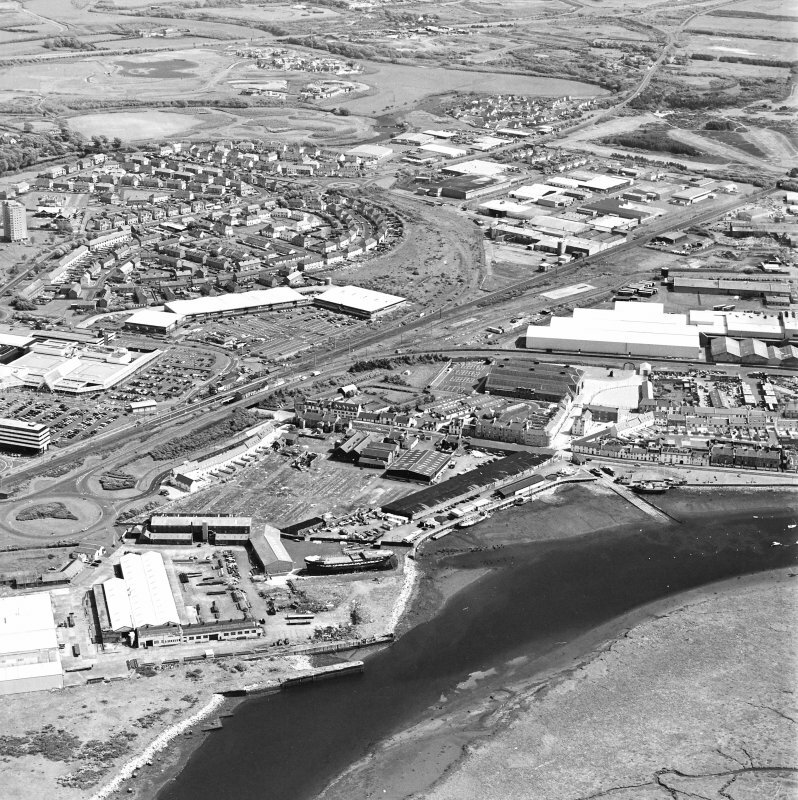 before the foundation of Port Glasgow [NS 321 747] in 1668, Irvine served as an outlet for Glasgow's overseas trade, the goods being brought to the port overland on horse-back. 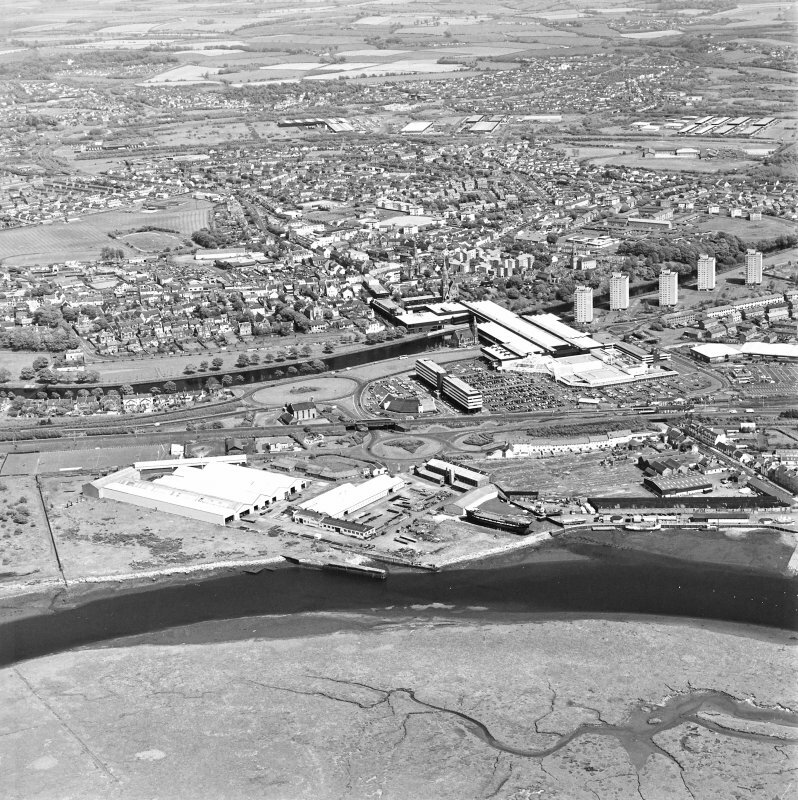 Irvine is only 26 miles [41.9km] from Glasgow, and thus compares well with Greenock, at 23 miles [37km], and it saved the navigational difficulties of the Clyde estuary, at that time still unimproved. 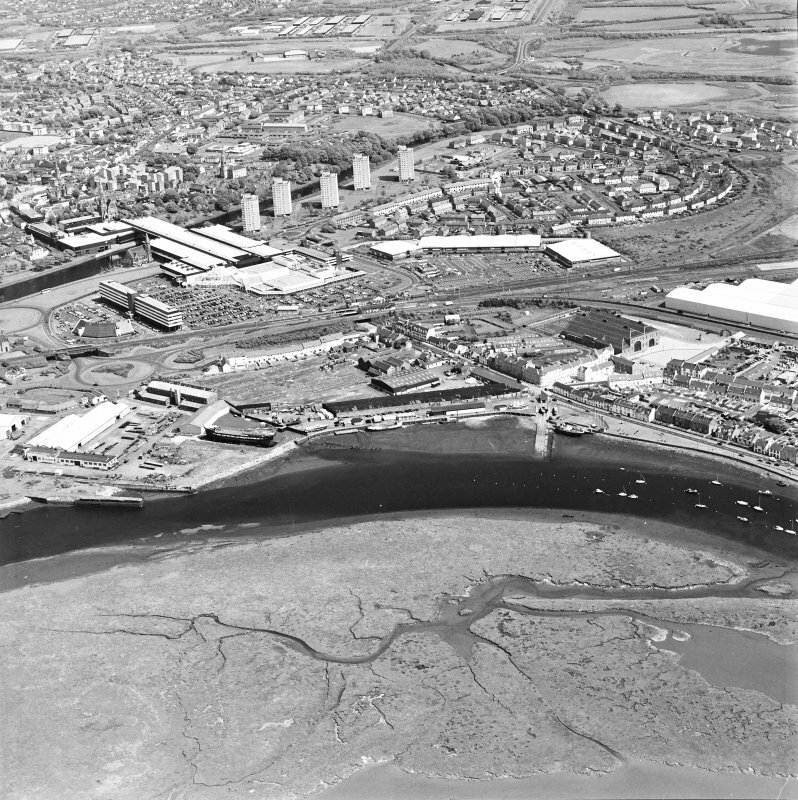 The silting-up of the Irvine estuary may have influenced Glasgow's decision to found Port Glasgow, as was done in 1668. 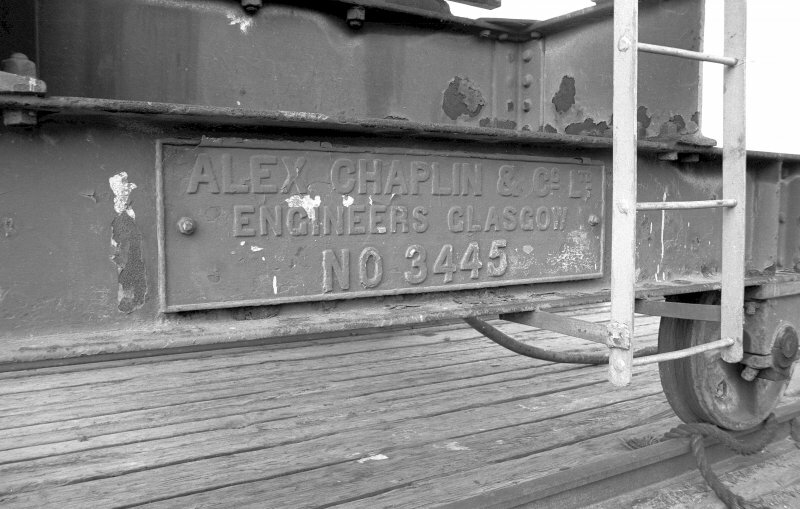 The export of coal from the neighbouring Ayrshire pits was developed from the late 17th century. By 1793 over 24,000 tons were being shipped annually and 51 vessels, of from 33 to 1650 tons, were engaged in the trade. At an earlier period, it is recorded, the coals 'were carried coastways in birlings or small boats. When these arrived, they blew a large horn, which was fixed to a post at the quay by an iron chain; and, upon this signal, the country people loaded their poneys or small horses, and carried down what quantities were wanted'. A great part of the total exported seems always to have gone to Ireland, and by 1839 the total annual figure had risen to 44,000 tons. 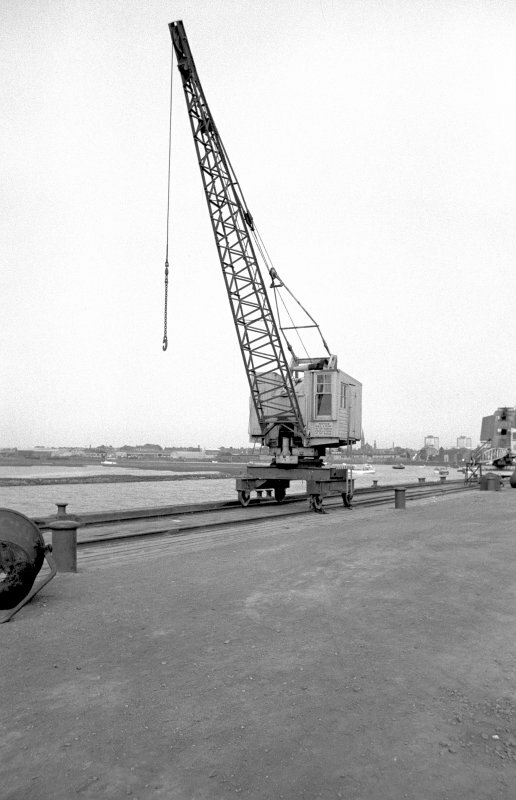 Imports included hemp, iron, Memel and Norway timber, ship-building timber from Wales, and hides and grain from Ireland. 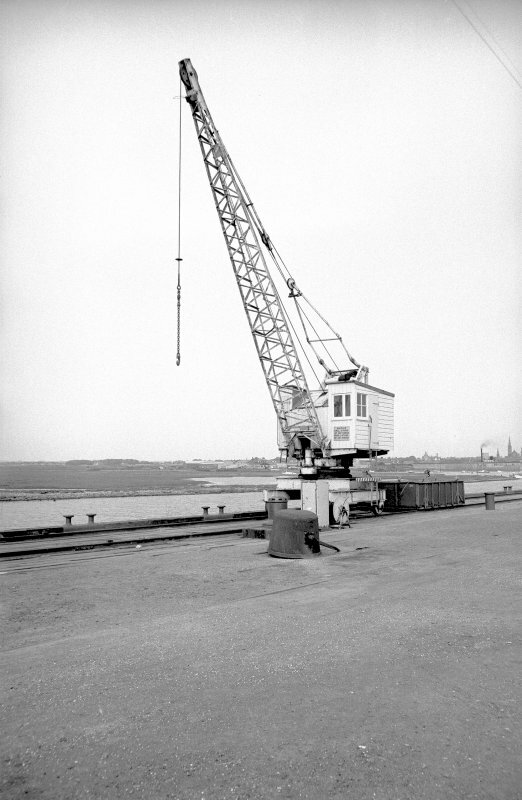 The importation of Irish grain was forbidden by law, but the Irvine merchants seem to have taken the view that, as burgesses, they were not subject to the general legal penalties imposed by the county justices, and accordingly resorted to smuggling - 'stealing (the grain) in by night at many secret creels along the shore'. A law-suit arising from this argument is cited from as early as 1712. On smuggling in general at Irvine, the same passage states that, about 1720 'and for a good many years afterwards, smuggling appears to have been carried on very extensively and in a very daring manner' the Customhouse there was repeatedly broken into and robbed of large quantities of seized goods by bands of armed men' Latterly smuggling was chiefly confined to whisky from Arran', and by this time had 'almost entirely ceased'. 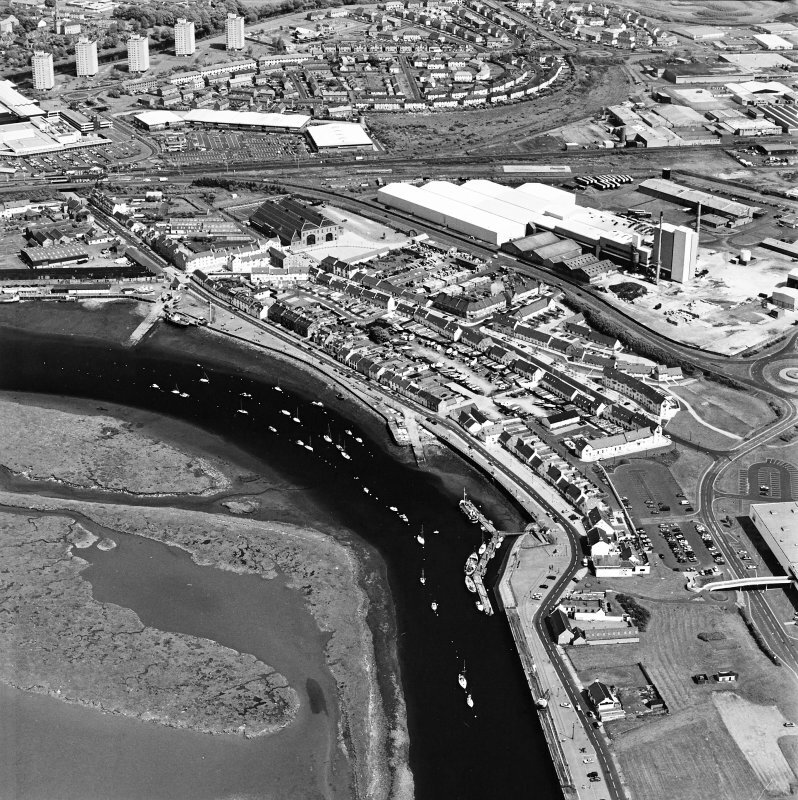 This harbour comprises essentially moorings along and within the channel of the River Irvine to the S and E of Bogside Flats [name centred NS 308 390]. 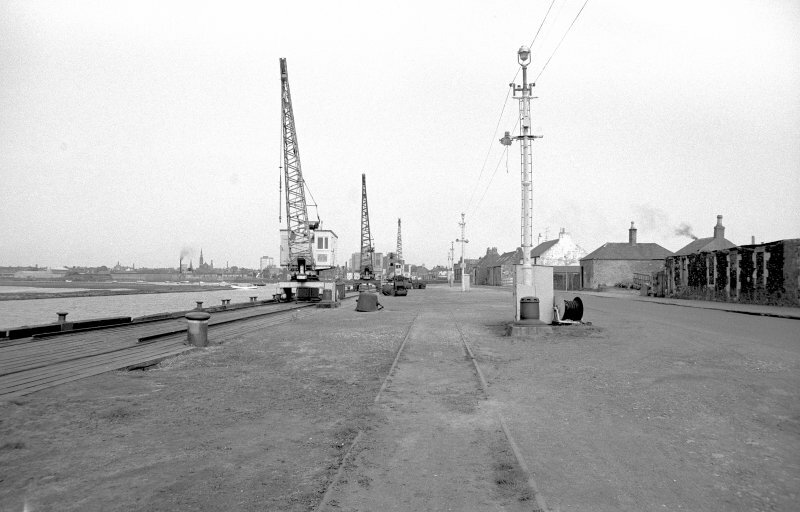 Other than the pilot house [NS33NW 40.02], the pontoons and slipway of the Scottish Maritime Museum [NS33NW 63.00] and the Ardeer works jetty [NS23NE 1.05], there are no harbour works as such.